Pssst… Don’t forget to check out my list on 23 Unique Things to do in San Francisco! Loews Regency has several options for the best view. They have a city, bay and golden gate bridge view – the trifecta! This clean and classic styled hotel offers rooftop weddings, an expansive fitness center, and is in a prime location. You are minutes away from union square in the financial district. It is just far enough from the extremely tourist area of Fisherman’s Wharf, but still close enough to only be a 10 minute cab ride away. Cavallo Point is the perfect spot for a romantic getaway. They offer cooking lessons, spa days, live music at the bar and beautiful views of the bay. This hotel is located in romantic and quiet Sausalito. You can escape the city without being too far from the major sites! And to top it all off, they have a stunning view of the Golden Gate Bridge right from your bedroom. In classic Hilton style, the rooms are clean and modern. The selling points of this hotel is the rooftop bar with floor to ceiling windows, large buffet breakfast, and outdoor pool and hot tub. The options when booking is another factor that makes Hilton world renowned. Not only can you choose to have a view, but you can also choose what floor your prefer! This quirky, nautical themed room will really make you feel like you are in Fisherman’s Wharf. The brick walls and adorable design makes this hotel such a unique find. The location is the best selling point of this hotel – being right in the heart of Ghiradelli Square, Fisherman’s Wharf, and Pier 39. My favorite hotel in all of San Francisco! This hotel is perfectly staged for the younger crowd looking to meet other travelers. Not only are the rooms and views fantastic, but what makes this hotel so unique is the amenities. There is a game room, large courtyard with fire pits, a food truck in the courtyard, and multiple bars to choose from. This is another nautical themed hotel, located in Fisherman’s Wharf. Pure luxury! This hotel is a perfect choice for families or multiple couples. It is an apartment style hotel that has a kitchen, living room area, and separate bedrooms. This hotel offers a wine and cheese mingling hour and is centrally located in Ghirardelli Square. Steps from your hotel you can sit by the fire pits, go to restaurants, and get Ghirardelli’s famous ice cream! If you want to stay outside of San Francisco, this is the hotel for you. In the downtown Sausalito area, you can stay in a clean and bright waterfront hotel. The views from the rooms are very different than the other “city view,” like listed above. You will get expansive views of Sausalito’s famous waterway. Similar to the Fairmont on Ghirardelli Square, you have options to stay in a standard room or a suite with multiple bedrooms. Another great option for families! While the rooms look like a standard room, the selling point of this hotel is the impressive rooftop bar. The view from the 39th floor looks out at the bay, Golden Gate Bridge, and Financial district. Another great location in Union Square leaves you right in the center of all the best sites. Westin Hotels never disappoint! They are always beautifully designed, prime location, and reasonable prices. They also have fantastic amenities such as a bar, fitness center and being pet friendly. This hotel is also located in Union Square. If you want a Golden Gate Bridge view, this is the #1 hotel. You will get a beautiful view of the San Francisco Bay Area and Golden Gate bridge, right from bed! In addition to the million dollar views, there is an outside rooftop lounge, spa and restaurant at the hotel. The W is located in the hip SoMA district of San Francisco. The interior of this hotel shows off it’s artsy side with every detail. The bars, restaurants, and fitness center are all so unique that you feel like you are walking through a museum! The views from the bedrooms lookout over the bay area and Golden Gate Bridge. My favorite part about this hotel is the fitness center. Trust me, I am not one of those annoying people who wake up with sunrise on vacation to go exercise (curse those people), but this fitness center may change my mind! Hotel Kabuki is an Asian-inspired hotel located in Japantown. You are minutes away from delicious ramen and sushi, without being too far from all of the major sites. The entire hotel has been renovated, so when you walk into the older style building, your mouth will drop with a amazing design. This bright and airy hotel is located extremely close to China Town. You won’t have to walk far to access the best restaurants in the city. This hotel is also directly next to the cable car stop, making it unbelievably easy to get around the city. You have to like a certain style to stay at this hotel, it’s definitely unique to say the least! This hotel is old school glamour, with a touch of royalty to it. The plus side of this hotel is the rooms are spacious and the location is prime. Your room will look over Huntington Park and Grace Cathedral. This darling hotel has a Bed and Breakfast feel to it, minus the awkwardness! Being steps away from Presidio National Park and the Golden Gate Bridge, this is one of the best locations in the city! This is the #1 choice for travelers interested in architecture, the detail on this place is worth a look! This incredibly unique hotel is beautiful inside AND out! Your room will be bright and airy with it’s floor to ceiling windows covering the entire room. And if you still feel like you can’t see the view well enough, most rooms have balconies as well. If you love baseball, this is the hotel for you. Located directly next to the AT&T park where the San Francisco Giant’s play. 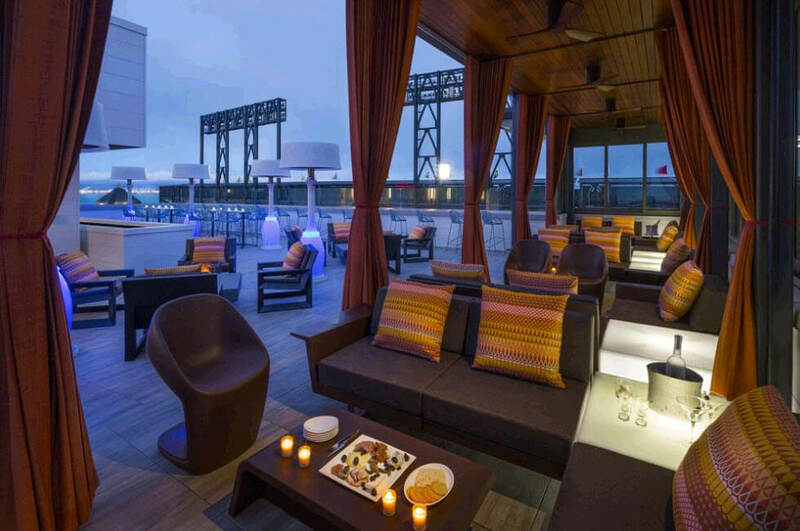 You can enjoy your baseball stadium view from their rooftop terrace that has fire pits and heaters. Did my guide help you choose the hotel of your dreams? I would love to hear all about it in the comments below! If you booked your trip to San Francisco, don’t forget to check out my guide on best things to see in San Francisco.